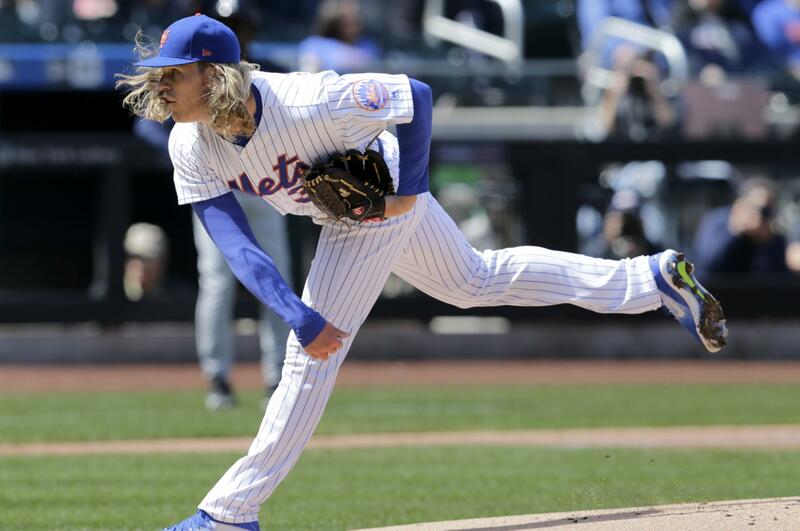 Mon., April 3, 2017, 10:42 p.m.
NEW YORK – Noah Syndergaard struck out seven over six sharp innings in his first opening day start for New York before leaving with a blister and the New York Mets beat the Atlanta Braves 6-0 on Monday. Asdrubal Cabrera snapped a seventh-inning tie with a single and the Mets broke through following a pivotal replay reversal at the plate in which Wilmer Flores initially was called out. New York took advantage of five walks by a shaky Braves bullpen in a six-run bottom of the seventh that lasted 35 minutes. Curtis Granderson had a sacrifice fly and Lucas Duda busted the game open with a three-run double off Eric O’Flaherty. Hansel Robles (1-0) worked a perfect inning for the win. Ian Krol (0-1) was the loser. WASHINGTON – Adam Lind’s first swing as a member of the Nationals resulted in a pinch-hit, go-ahead, two-run homer in the seventh inning, and Bryce Harper went deep on opening day for the fifth time in his young career, leading Washington past Miami. Stephen Strasburg (1-0) earned the win, allowing two runs and six hits in seven innings, pitching out of the stretch the whole way. It was his return to action after missing last September and the playoffs with a right elbow injury. Matt Wieters singled ahead of Lind’s drive off David Phelps (0-1) that made it 3-2. BALTIMORE – Mark Trumbo homered off Jason Grilli (0-1) with two outs in the 11th inning in a rematch of last year’s A.L. wild card playoff, won by Toronto 5-2 on an 11th-inning home run by Edwin Encarnacion. Tyler Wilson (1-0), the fourth Baltimore reliever, pitched one shutout inning in the 25th Camden Yards opener. BOSTON – Rookie Andrew Benintendi hit a three-run homer off Gerrit Cole (0-1) that capped a five-run fifth inning as Boston began its post-David Ortiz era. Rick Porcello (1-0) gave up three runs and six hits in 6 1/3 innings while striking out five. Craig Kimbrel retired Starling Marte on a game-ending popup with two on for the save. MILWAUKEE – Bud Black won his debut as Colorado manager, and Greg Holland got a save in his first game with the Rockies. Mark Reynolds homered, had three RBIs and scored the tying run in a two-run seventh following two defensive lapses by Milwaukee. Milwaukee’s Junior Guerra left his first opening-day start in the big leagues after three innings with a strained right calf, grimacing as he broke out of the batter’s box after laying down a bunt. The right-hander will go on the disabled list. Carlos Estevez (1-0) pitched a hitless sixth. Holland, who missed last season while recovering from Tommy John surgery, walked Jonathan Villar leading off the ninth, then retired Eric Thames one a lineout to center and Ryan Braun on a game-ending, double-play grounder started by third baseman Nolan Arenado, who dove to his left. MINNEAPOLIS – Miguel Sano homered and drew the third bases-loaded walk during a dreadful seventh inning for Kansas City’s bullpen, and the Twins won an opener for the first time in nine years. Ervin Santana (1-0) gave up two hits and two walks while striking out three over seven innings, aided by two diving catches of sinking line drives by center fielder Byron Buxton. Matt Strahm (0-1) and Travis Wood allowed four runners while recording only one out. CINCINNATI – Cesar Hernandez opened the Phillies’ season with a homer on Cincinnati’s eighth pitch, and Jeremy Hellickson drove in a run with his first career triple. Hellickson (1-0) pitched into the sixth, allowing a run and six hits, and he also contributed his RBI triple in the sixth. Right fielder Scott Schebler failed to make a diving catch of his two-out liner, letting the ball get by him as Hellickson chugged across an infield turned muddy by several innings of rain. Jeanmar Gomez gave up Scooter Gennett’s two-out, two-run homer in the ninth before retiring Billy Hamilton on a routine fly for the save. Scott Feldman (0-1) allowed three runs and seven hits over 4 2/3 innings in his third opening day start. LOS ANGELES – Joc Pederson launched a grand slam and the Dodgers backed Clayton Kershaw with a franchise-record four home runs on opening day. Pederson drove in five runs, Yasmani Grandal homered twice and Corey Seager added a three-run shot. Kershaw (1-0) allowed two runs – one earned – and two hits in seven innings, struck out eight and walked none in his seventh consecutive opening day start. Jhoulys Chacin (0-1) gave up nine runs and eight hits in 3 1/3 innings in his Padres debut. ARLINGTON, Texas – Abraham Almonte singled in the go-ahead run in a three-run ninth as Cleveland won the opener of its AL title defense. Making his first opening-day start for Texas, Yu Darvish had a 5-1 lead behind Rougned Odor, who homered twice and drove in four runs. Edwin Encarnacion tied the score 5-5 with an eighth-inning homer off Matt Bush, and the Indians went ahead against Sam Dyson. Carlos Santana added an RBI double and scored on Michael Brantley’s single. Andrew Miller (1-0) struck out two in a perfect eighth, and Cody Allen got the save by striking out the side around Elvis Andrus’ triple. HOUSTON – Dallas Keuchel (1-0) allowed two hits over seven innings, Luke Gregerson and Ken Giles completed the three-hitter and Houston won its fifth straight opener. George Springer became Houston’s first player since Terry Puhl in 1980 to lead off the first game with a home run. Carlos Correa homered and drove in two runs. Felix Hernandez (0-1), making his 10th opening day start, allowed two runs and five hits while striking out six in five innings before leaving with tightness in a groin. Published: April 3, 2017, 10:42 p.m.